View cart “Victoria Double Deluxe Tweed Combo Guitar Amp” has been added to your cart. Soldano Hot Rod 50+ Plus Tube Guitar Amp Rare Black-n-White Boa W/Matching 2×12 Cab in mint condition. 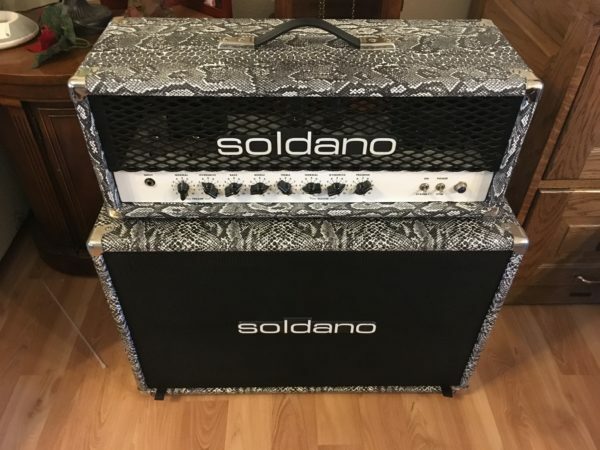 Awesome Soldano Hot Rod 50+ head in rare black and white boa with matching Soldano 2×12 cab. 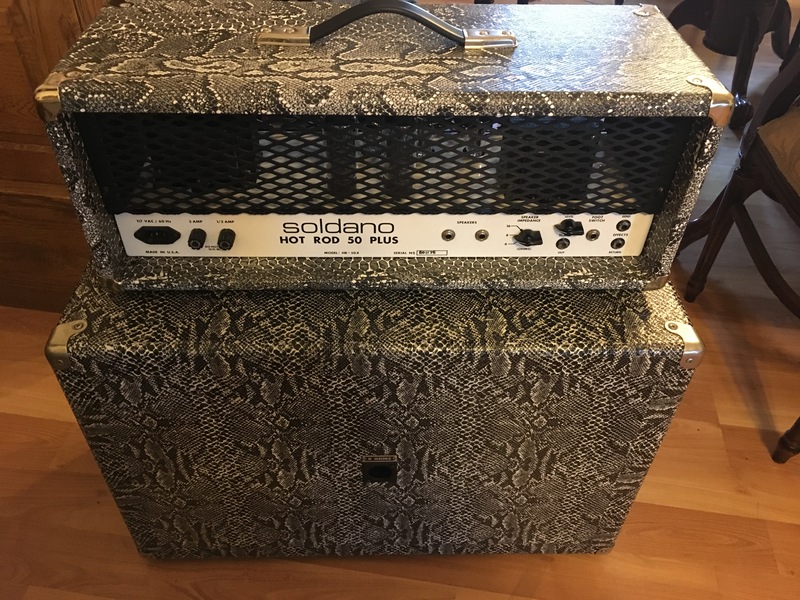 With Mike Soldano retiring these amps and cabs are not being made any more and are becoming extremely hard to find. 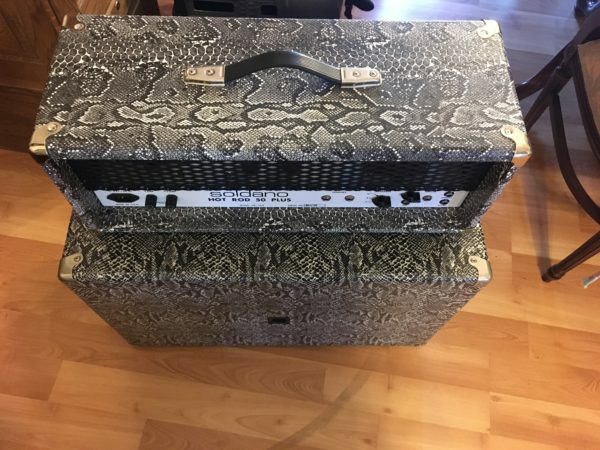 The black and white boa was probably the most popular of all the custom coverings that Mike offered and this is a great example with matching 2×12 cab. Amp sounds tremendous and has new tubes. Everything is in killer condition. If you want an incredible sounding, collectable piece of Soldano history, this is a great one to pick up. 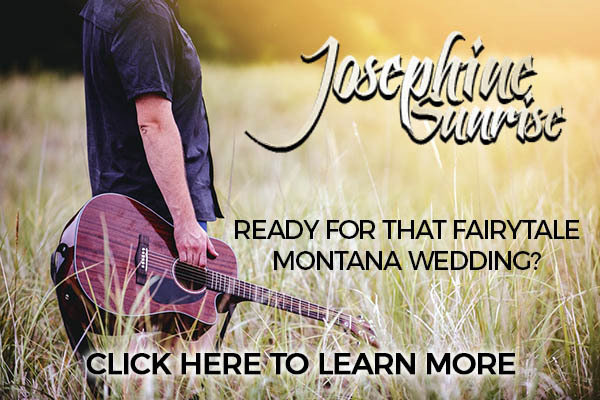 Classic American hot rods and guitar amps. In both cars and gear, pursuing the perfect look and performance can be time consuming and expensive. Where amplifiers are concerned, random tinkering doesn’t always produce perfection. The HOT ROD 50 PLUS gets you there right out of the box. This high gain, two channel amp comes fully loaded with the most asked-for modifications built right in. With circuitry based on the legendary SOLDANO 100w SUPER LEAD OVERDRIVE, the HOT ROD 50 PLUS offers all the tonal range you want with all the mods you’ll ever need. 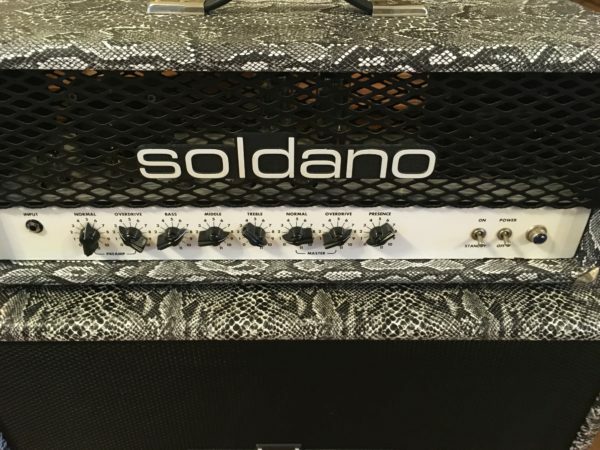 And don’t be fooled by it’s 50 watt rating, this monster head packs more sonic firepower than you’ll likely need. The HOT ROD 50 PLUS features a tube-buffered effects loop and effortless noise-free channel switching between the Normal and Overdrive Channels. There are independent Preamp gain and Master Volume controls for each channel. Bass, Middle, Treble, Presence, and Depth controls provide the tone shaping. A rotary Impedance selector switch allows the use of 4, 8, or 16 ohm speaker cabinets. All SOLDANO speaker cabinets are made with top quality 13mm and 19mm thin ply Russian birch plywood and feature solid single piece construction. There are no removable back panels or baffles. All joints are glued and nailed together. The grilles are attached with velcro and pull off for easy access to the speakers. Speakers are front-loaded and the cabinet front and back are braced internally for an extremely stiff, rigid box and tight, solid bass. The corners, side handles and jack plates are all steel, not plastic. Corners are available in either nickel plate or black powder coat finish. 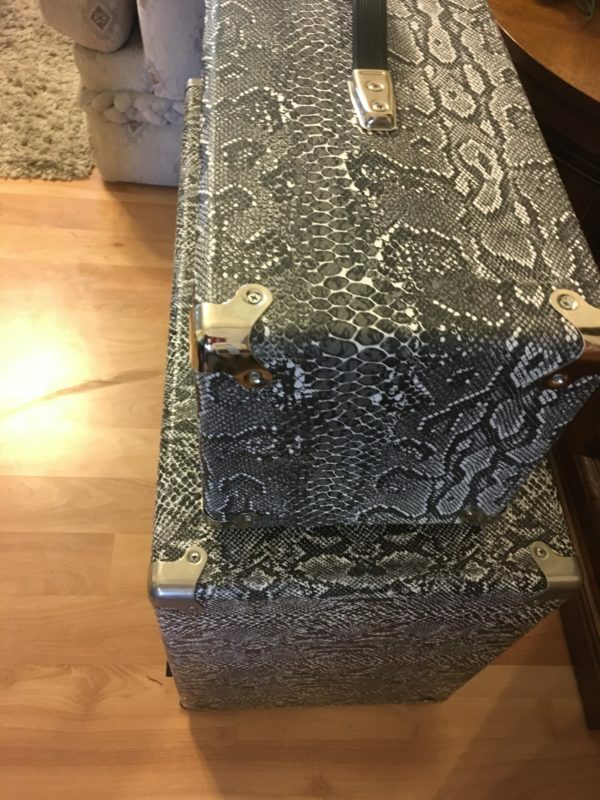 Our standard colors are Black, Purple, Red, Orange, Navy Blue, Regency (medium) Blue, Vintage Cream, White, and Boa (black & white snakeskin print). We offer many more custom-order colors, such as metalflake sparkle Naugahydes as well. Standard grille coverings are Black, Black Sparkle, Silver, and Oxblood. As with the cabinet covering, other custom-order grille coverings are available by request. We use USA-made Eminence Legend V1216 loudspeakers in all of our cabinets. We find this is an excellent-sounding, well-balanced speaker with a voicing that compliments our amplifiers beautifully. Cabinets are also available empty should you prefer to load your own speakers. 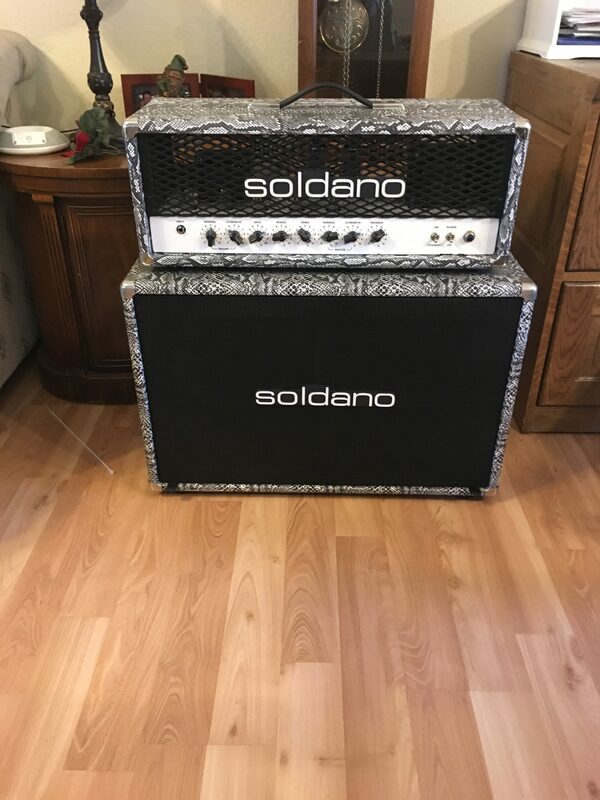 The SOLDANO 2×12 SPEAKER CABINET is a sealed back cabinet. Due to its large internal volume per speaker, this cabinet has extremely deep bass response and the “chug” normally found only in 4×12 cabinets.